"Just dropping a line to tell you that I passed and I can honestly say that your course was the best one I attended in terms of tips & techniques for all components of the exam. Your viva course was especially useful as I found that the examiners were continuously pushing me to the limits of my confidence and knowledge, just like you did. When I felt that I had slipped up on a few cases, your 'happy stupid' tip was at the forefront of my mind! Your strategies for the long cases & rapids were also invaluable. I'm very happy and relieved to have passed and am very, very grateful to you indeed. Thank you so much again and I do hope our paths will cross again some day. " "I just wanted to let you know that I passed my 2B exam on this sitting with a 7 on the Rapids. Thank you for organising a useful course for Rapids prep!" "This one day course is great for honing our skills to match the most used mantra of 2B revision, 'don't overcall!' It is different to other courses as instead of just practicing and correcting Rapids packs, we actually go through each body part, look at the potential pitfalls and learn the exam technique, something which I lacked despite doing hundreds of practice packs and courses before. The key is to be confident in what is normal and with Dr Vlahos' wonderful teaching styles this hurdle can definitely be achieved. " First sitting Rapids 4.5, this sitting 7! "We all passed the rapids and the exam!" "We are really grateful for the courses and support you gave us!" "Thank you again for your advice and feedback - it really was incredibly helpful." "Thank you. You've helped so much. " I sat my 2b exams feeling prepared but failed. I remember feeling very down. I decided I was not going to throw my money at more of the same kind of course. I decided to make Grayscale courses the only course I go on and immediately got emails from Johnny. At first I thought the email was automated but he replied straight away himself giving me advice and telling me that he would help me get through these exams. The pre course material was really useful and we got personal feedback on each case. Then the course day itself is exactly what I needed. Johnny is an amazing teacher with vast experience and fantastic cases. Even during the day the teaching felt personalised and aimed to work on our individual weaknesses. After the course his interactions and advice did not stop. It really felt as though I was not alone in this and that if I needed any advice or help Johnny would be just an email away. Before I knew it the big day had arrived again. It was time to sit the exams. I used everything Johnny taught me. What to say...and even what not to say and the exams felt like it went well. I thankfully passed on the 2nd sitting. 1st sitting marks were: Long 6, RR 5, Viva 11.5. 2nd sitting marks were: Long 6, RR 7, Viva 14. The marks speak for itself and I owe a huge amount of it to Johnny. If you are sitting there debating, I strongly recommend that you just book yourself on his courses as soon as possible, especially if you are in a similar position to where I was. It is the best 2b course out there...and I've been on a few." "5 star teaching experience Johnny. When I was going through my viva cases, I was thinking about your advice. Thank you very much again." "Dr Vlahos is an excellent teacher and the course was worth the time and money. The course gave me more confidence in the viva for FRCR 2B and helped me gain a good pass as a buffer to losing marks in the rapid reporting station (I passed in the Autumn 2017 sitting). The plain film cases Dr Vlahos shows are amazing and certainly make you think outside of the box. I have recommended this course to other trainees in my deanery and I'm sure any participant would benefit from attending. Thanks Johnny"
"Thank you for your helpful course. I passed with 7 and 7.5 in viva! Very glad not to have any more exams!" "Good news from me, FRCR +ve! THANK YOU for your guidance and tips! The two days spent with you has definitely pushed me across the finishing line!" "With Blessings of Almighty God I passed FRCR exam. Your teaching on the course was really helpful, thank you!" " I am glad to inform you that I passed the exam, many many thanks for you and for your great efforts. I will recommenced your great course to my colleagues. Thank you very much." "I cannot recommend attending this course enough. Over the course of the two day original course, we saw in excess of 200 cases, far in excess of what is seen in other courses, with a keen emphasis on technique. Throughout the course, Dr Vlahos demonstrates how to maximize the points available on the cases you know, in order to make up for the inevitable difficult case that will present itself. 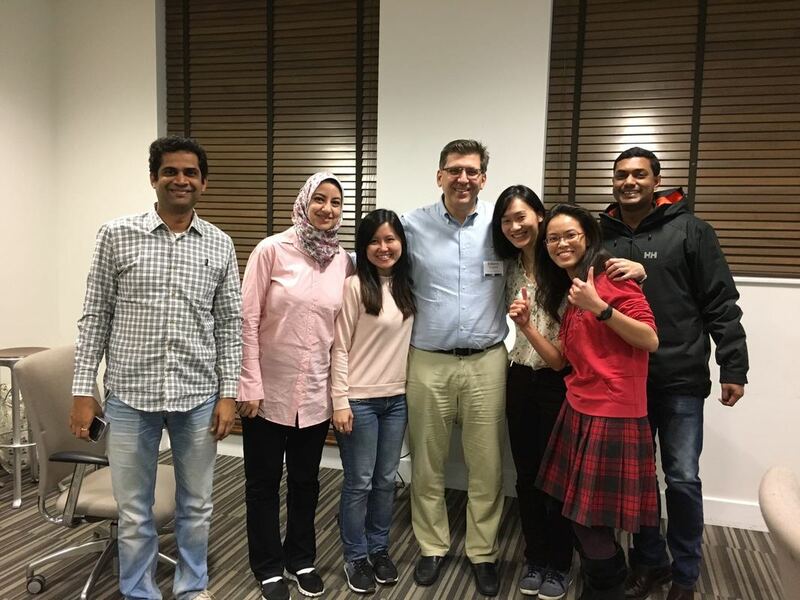 I found that the small groups really allowed for focused teaching, and as a result Dr Vlahos was able to get a good idea of our strengths and weaknesses and was able to give personalized feedback accordingly. Using the presentation techniques learnt on this course, I noticed an immediate improvement in my viva performances and was able to pass both viva stations as a result. When doing the long cases, I applied the principles that Dr Vlahos stressed on the written course and I am sure this played a key role in passing the exam on the first attempt. The USP for the Grayscales course is Dr Vlahos, who is clearly a keen educator that genuinely cares about the attendees. I was recommended this course by a colleague, and in turn will be recommending it to colleagues from my centre. As stated in my first sentence, I cannot recommend attending this course enough. "I actually postponed writing to you so that I can come up with something good to write on your website. I'm not sure I did. But I think this was not only a great learning tool, but also an inspirational course through the display of enthusiasm and passion for radiology as well as fabulous knowledge. Great value for money! I recommended it to my colleagues but apparently it's already booked! So I thank you for your efforts and I hope our paths will cross again. Until then, all the best!" I strongly recommend Grayscale course for viva preparation. Dr Vlahos has hundreds of the classic typical viva X rays which will backup our defect in those kinds of X rays. His advice of how to get 7&8 in each case and how to get 6 (pass) in cases you don't know were invaluable. His approach to interstitial lung disease and nodular lung pattern are amazing. The instructions he gave about rapid reporting were excellent and helped me to understand the philosophy of rapid reporting part of the exam. Thank you very much Dr Viahos, I've passed FRCR." "It was a great pleasure and an amazing experience to have attending your FRCR grayscale course. This was definitely one of the best course I attended. It was comprehensive and targeted towards what is essential for the FRCR 2B exam. The small group and personal approach was very helpful in furthering my knowledge and strengthening my weak areas in radiology. You had a very positive and approachable personality which added to the great experience. Thank you for the great care you put into teaching us the fundamental of radiology. Hope our paths meet again someday. Till then take care! I’ve already started recommending the courses to my colleagues." "I passed the FRCR! Thank you so much for supporting and believing in me . I am so glad that I met such a wonderful person who is passionate about teaching during this journey. " "Hello, I just wanted to let you know I passed. Thank you for the amazing course and all your help. Thank you"
"I would like to thank you so much for your great efforts in the Grayscale course & for your invaluable advice to us regarding exam. Happily I would like to inform you that I have passed the exam. " "Just to let you know…. I PASSED!!!! Thank you very much for all your excellent teaching, I’m sure that secured my pass!!" "Just let you know I have passed the exam. Thanks for your guidance and help. It has been so very helpful." "I passed!!! My viva went very smooth and thoroughly enjoyed the experience. Thank you very much for your great course and amazing tips. I've used many during the viva. I'm very delighted to getting to know you through your course and maybe one day I get to work with you. " "Thank you very much for your original 2 day viva course. I very glad to say that I have passed the FRCR 2B exam on my 1st attempt. Johnny’s course is unique as he presents a large amount of very interesting/ challenging cases to a small group of registrant over a 2 day period and he strives to improve everyone in the group. Johnny is very organised and starts interacting about 8 weeks before the exam with weekly cases and personalised feedback. Johnny provides post course individual feedback to further polish the candidates. I’m very sure that his long case and RR courses are equally excellent and I highly recommend them all. " "I was about to send you a thank you message. Your teaching was immensely helpful in overcoming what seemed to me like a mammoth task. Needless to say that I shall highly recommend your course to my peers. Once again, thank you for all your teaching and kind words." "I am delighted to inform that I have cleared the exam! It was a seemingly impossible task for me, and being so short of time, yours was the only course I attended. You are a great teacher, conveying so much information in such a short time is just amazing. Thank you very much for your guidance and constant encouragement. I hope we may interact again!" "I attended a few courses in UK, and found out I benefited the most from the Greyscale course organised by Dr Johnny. He is a great teacher and very encouraging. He gave us precious individual attention which is lacking in other courses. Great varieties of cases were shown and useful personal feedback was also given at the end of the course. I would highly recommend this course to everyone. Thank you very much, Dr. Johnny." "Grayscale is the most extraordinary and the best FRCR 2B course I have ever attend! Cases from Dr. Vlahos are very special which cover wide range of diseases/pathology tested in the exam. Tips and phrases of how to present a particular case are really helpful not only for viva but also for long case and rapids. The feedback is the most detailed and to-the-point among all the courses. This points out my weakness, strength and most importantly how to improve the performance in the last one month. I would highly recommend this course to all the candidates taking the exam!" "I passed my 2b exam in Singapore. Thanks a mil for your teachings. I learnt a lot from your course and food was also lovely. I'll definitely recommend your course to my juniors. Not to mention all the pre and post course emails and materials. You're just a wonderful teacher. I haven't gotten my breakdown for the 2b yet. I was told by my consultant that I flunked the rapids but I did a miracle with my vivas. I treated them as a clinical consultation indeed had conversations with the examiners. I even stopped looking at the screen, turned to face and discuss with the examiners. I also remembered to go as clinical as I can be during my vivas e.g. this lucency over the pubic tubercle could be an inguinal hernia, can just check clinically to see if there is one; the examiner pushed me to say more so I just looked at him and said roughly: well, if can't be found clinically we can do an US or CT but there is no evidence of bowel obstruction on this radiograph. He was satisfied and even gave me a reply: there was indeed an inguinal hernia and smiled. Thankfully my examiners were encouraging. Going through your course gave me the confidence that I've seen a number of cases and boost my confidence during the exam. You encouraged us to speak too during the course despite us not knowing them. It was a lovely experience going through your course. I also remembered your advice to take things as they come and your story about the candidate who failed the exam coz of bad vivas thinking he failed his written when he actually didn't . If i was to lament on the rapids which I had a bad feeling about, i might have failed to focus on my vivas. Then again, it probably calmed me down for the rapids as I already thought i was a goner after the written. Thanks and thanks and thanks again. What a relief it's over now. " "Hi Dr Vlahos. Glad to inform you that I passed the exam. Thank you so much for your wonderful course. Couldn't have done it without your help!" Still happy at the end of tow intensive days! "Grayscale course was a great two day review of some excellent variety of cases. I liked the small group aspect, you were attentive to all individuals and the tailored feedback is very useful. There were many exam tips that actually made a difference to my approach. I especially appreciated the teaching topics, lung nodules in particular, which i have finally understood and can apply in my clinical practice. Thank you I'm very happy and life definitely feels more easy going now. I can start enjoying radiology! " "I wanted to thank you for all your help. I have been to other frcr courses but yours is truly very different. You showed a variety of cases (some very difficult ones) and taught me about the pathology and good technique to present cases. None of the other courses do this. Not only did this help me in the exam but in my normal day to day practice. The written course was useful as you went through the individual sections present in the exam and explained the significance of them in a way no other course does. Overall I feel you were really focused and dedicated in making me pass, the before and after coursework you gave with the feedback was excellent. Thank you for helping me to pass and actually making me a better Radiologist." "Dr Vlahos's course is a must-attend for the FRCR final part B. He shows an extensive range of cases from exam-classics such as skeletal dysplasias, scurvy, various forms of congenital cardiac disease, barium studies of inflammatory bowel disease to uncommon presentations of common entities such as TB in unusual locations. He gives very good explanations, differentials and tips on how to present even when one is not sure. He is encouraging and caters to participants of all levels of expertise. Each participant gets a chance at the hot-seat ala actual 2B viva. Definitely worth every pound paid." 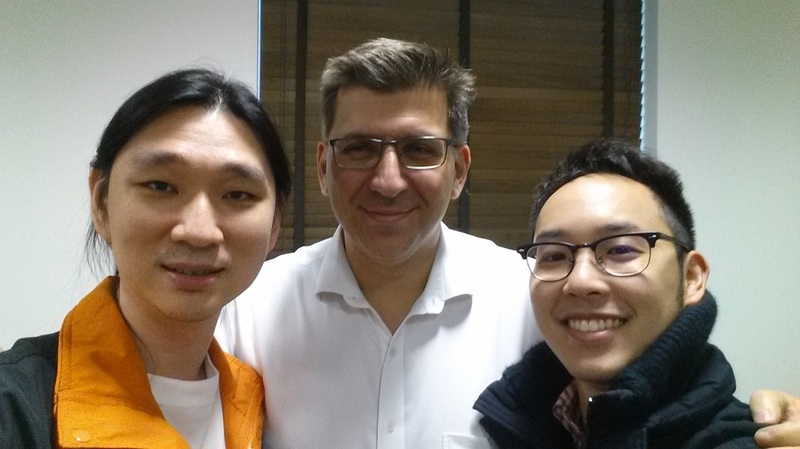 Dr Vlahos (centre) with great Singapore trainees Drs Ivan Ho (left) and Keefe Lai (right) after the course! "Thank you for all your help and advice, it really helped. I am very grateful. I will recommend your course to everyone taking the exam. You are such a talented and inspirational educator, your trainees are lucky to have you. Your exam technique tips were clearly well above any other 2B course on the market, makes your course unique and essential for passing the exam! I am grateful for the feedback I received from you. It really helped in terms of an exam point of view as I definitely speeded up for the long cases and was more definitive about my diagnosis in the viva." "There are several reasons why the Grayscale FRCR Course stands apart from other FRCR Courses. I should know best. I have been to several courses over the last 4 years . Firstly it’s a small group teaching. Thus Johnny is able to focus on each candidate and give us individual attention unlike several other courses . Johnny isn’t greedy to make money by packing a hall full of candidates. Instead it’s his passion for teaching and his genuine desire to interact with candidates and help them optimize their performance which stands out. In addition, he sends us valuable exam style cases as well as RR packets via the internet before and after the course. He also takes the trouble to send each candidate a detailed individual feed back with their strengths and their shortcomings as well as ways to enhance their performance and overcome their areas of weakness. During the 2 days we have in London He shows us a large variety of exam cases some in rapid fire to expose us to a large variety of pathology, all of which were exam quality cases which helped me to pass .In other courses you may be lucky to see 30-40 cases . But in the Grayscale course it’s far more than this. He also gives us tips on how to talk your way out of a case you don’t know , how to sound safe and sensible to pass the film and how to think out of the box. The 2b exam is a game and in the FRCR Exam there are no coincidences! No one I’ve ever seen plays the Exam game better than Johnny . He has Tips & Tricks on what the examiner is looking to hear in each case. Say those magic words or BUZZ words and you will pass the case. Also once you seen one abnormality , FRCR exam is about looking for and picking other abnormalities and joining the dots to make a final diagnosis and get maximum points . So if you see one abnormality, how to look for related / associated abnormalities is an important skill. In addition his advice on the SET PIECE technique was excellent. What this means is u need to make a Standard dialogue for several common cases and practice it in the shower . So in the exam the moment you see this case you are not fumbling for words and can dispose the case in a very impressive manner. Can you make the perfect diagnosis like an Aunt Minnie and fail the case in an FRCR Viva ? Yes you can ! An example for this was a Congenital Lobar Emphysema in a 2 year old child CXR. All the other courses would have said excellent and moved on . Not Johnny. Unless you say you would compare with a prior film or wanted to exclude Foreign Body the examiners mark you down for lack of safety. Johnny was the 1ST person who taught me this. Most people fail the FRCR not because of lack of knowledge, but because of poor technique or poor communication. By following the advice I got from Johnny , I was able to enhance my performance and pass this time. I would very highly recommend this course. It’s worth every penny. I just wish I were fortunate enough to have trained under Johnny or wish I would have known about this course earlier. In that case I reckon I would have passed earlier." Initial: Hi Johnny the viva went well! Later: Hello Johnny, I passed! Thanks for your help and support, really appreciated it. Later: It feels good not having to think about exams ! I scored really well in the viva (6) and (7) and well in the Long cases which helped to save me as I didn't do so well in the Rapids. I found the small group tutorials and vivas on your course excellent , particularly when you gave examples how you would approach cases as a candidate. All the other courses are too big and aren't able to provide valuable feedback and continuity. I will definitely let others know. "Dr Vlahos' course is different from the others: it is small and combines intensive vivas; the opportunity to go through a huge number and range of films from the conventional to the extraordinary; short lectures on a few topics which give key nuggets to understand difficult concepts; all of which underpinned by his seemingly limitless knowledge and enthusiasm. He has learnt from some of the greats of US and UK radiology and it shows in his complete mastery of so many diverse topics. Although it is huge cliche to say this, he clearly has a passion for teaching, and manages to successfully deal with the thorny problem of variability in the group: stretching those who want/need to be pushed and gently guiding those who are less confident. His collection of films is unparalleled and the small group structure means you all get to see all of them. Overall I cannot recommend the course highly enough." "I thought the course was fantastic. We saw so many cases in all specialties, and many difficult cases that really challenged us. It was clearly well thought out, well paced and different styles of teaching used to keep it interactive and varied. The venue was excellent - easy to find, comfortable and the fact that we could have drinks whenever we wanted made it much more comfortable. Too many times on other courses, we end up longing for a cup of coffee!! I know that's a small thing - but it makes a difference. The unique thing about the teaching was the small group and individual attention. It was an effective, non-threatening environment. We were given the opportunity to get to know each other and get to know you. You are clearly extremely knowledgeable and were able to answer almost every query we had! I aspire! You kept up the energy and enthusiasm at all times and that was really encouraging. It was brilliant to receive cases direct into our inbox too over the weeks before the course! You gave us a lot of tips on delivery which were excellent. Some of these were completely new to me. " "I have not yet worked with a supervisor more committed to my personal learning, training and career progression. Every session with him is an excellent learning experience, particularly given his encyclopedic knowledge which he shares with his trainees so enthusiastically"
"The attribute that most distinguishes Johnny Vlahos as an outstanding educator and role model is not just his tireless commitment to research and training, but the fact that he combines those passions with a friendly and welcoming attitude to all registrars and a healthy dose of humour." "Teaching a trainee 'how to think' is perhaps one of his greatest strengths"
"The thing that most sets Dr Vlahos apart from other trainers is that he genuinely cares about his trainees and wants us all to perform to the best of our abilities. He understands that trainees are individuals and is able to identify our strengths and weaknesses and help us overcome our obstacles in training"
"Always approachable and unbelievably dedicated... quite simply the training scheme is so good because of his endeavours"
"Dr Vlahos is incredibly approachable and good humoured... always very supportive"
"A keen and dedicated teacher"